Located at 25 William Street, this Renaissance Revival brick building was constructed in 1901 and served as the high school until 1926. At that time a new addition was built on the right side for use as a junior high as well. Later, it became an elementary school and today, the building is rented to the SEEM Collaborative, a ten-town collaborative school serving children and youths with unique needs. 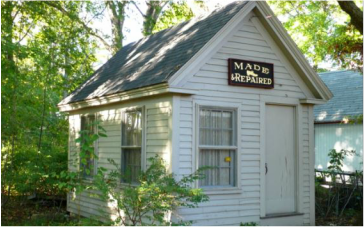 Located behind the Stoneham Historical Society at 36 William Street, Peter Doucett's Second Shoe Shop hearkens back to a time when the shoemaking industry in Stoneham was a specialized artisan craft. Buildings such as this came to be called Ten-Footers due to their size, and were used by cordwainers (shoemakers) to make and repair shoes. 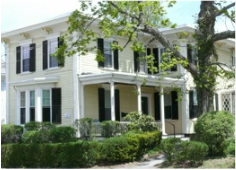 The building was moved from its original location on Pine Street in 1967, and placed on the National Register of Historic Places in 1984.​ The building housing the Stoneham Historical Society was originally built as a factory that produced items such as rolling papers for pharmaceuticals, and was later owned by the Spanish-American War veterans, who gave it to the Historical Society in the 1950s. Next, turn left down Pomeworth Street. On your right as you walk down Pomeworth used to be home to a chapel and convent. On the left are other buildings for St. Patrick's Parish. The original St. Patrick's school was built in 1910 and features beautiful ornate brickwork along its Pomeworth Street face. The Rectory was built in 1903. The cornerstone for the Gothic Stick-style St. Patrick Church was laid in 1887 and completed the next year for a cost of $38,000. In 1868, when the parish was established, it included not only Stoneham, but also Wakefield, Melrose, Reading and Lynnfield. 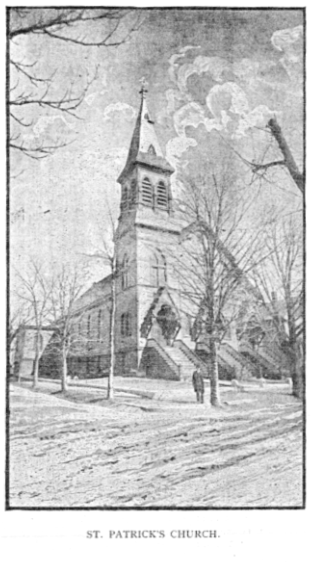 For the 20 years prior to this building being constructed, services were held in a former Universalist Meeting house, which the Diocese of Boston bought and moved to the corner of Central and Pomeworth Streets, opposite the current church. When built, St. Patrick was beige and brown and had separate steps and ornate door hoods with trefoil designs for each of the three doors on the front. The side addition was added in the 2000s. Next you will turn left and walk up Central Street back toward the town center. Located at 52 Central Street, this historic house was built in 1826 as the Town House (Town Hall) to separate town functions from church functions. It served as town hall until 1847 and also had a school on the lower floor. 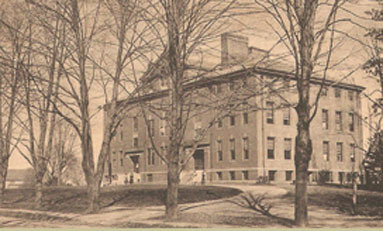 In March of 1833, the building was put on runners and pulled by oxen from the old town center, across Gould's Meadow (now Recreation Park) to its present location. Built in 1870, the Foster House is located at 57 Central Street. Walter K. Foster was an inventor and industrialist who was the owner of a pencil sharpener company near Stoneham Square. This mixing of Italianate and gable-front Greek Revival features is typical of many fashionable residences that were built near the town center in the 19th century. Located at 55 Central Street, the Farrier house is an excellent example of an Italianate villa. Amasa Farrier (1803-1883) was the town's first principal surveyor and played an important part in the planning of Stoneham. He designed Lindenwood Cemetery (1861) using Mount Auburn Cemetery in Cambridge (1831) as a model. Described as a man of great character, he held many important town positions. ﻿You've now arrived in Church Square, the next area of the tour.